INTRODUCTION/OBJECTIVES: Single incision laparoscopic surgery (SILS) is a new frontier in minimally invasive surgery. The limitations of SILS include head space constraints on ports, difficulty in range of movements and visualization. We present our experience with wide range of SIL colorectal procedures done without the use of single port device and with regular laparoscope. 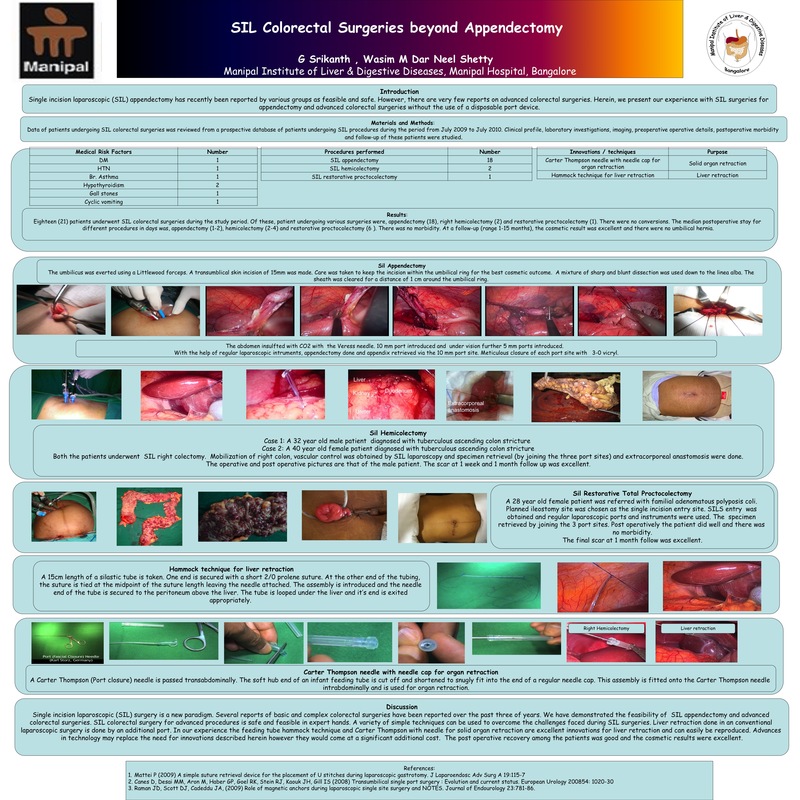 Clinical profile of patients undergoing SIL colorectal procedures from July 2009 to August 2010 were studied. Follow up was done in the out patient clinic at 1 week, 1 month and three months after surgery. RESULTS: Nineteen patients underwent various SIL colorectal procedures during the study period. Procedures included Appendectomy (16), right hemicolectomy (2) and restorative proctocolectomy (1). All the patients underwent the procedure without the use of commercially available single port device, with regular laparoscopic ports and instruments. However, innovative techniques were employed during hemicolectomy and proctocolectomy for adjacent organ retraction. There were no conversions. Two patients had morbidity in the form of wound infection. There was no mortality. CONCLUSION: We have demonstrated the feasibility of wide range of SILS procedures without the use of single port device for basic and complex colorectal surgeries. Innovative techniques are required to perform SILS procedures, particularly advanced procedures. The possible advantages with SILS are lesser postoperative pain, fewer wound related complications and shorter hospital stay. The definite advantages are an excellent cosmetic result and patient satisfaction.